While there are many types of cable, there are three main types, or categories, of Ethernet cable that are commonly used for network deployments: Cat5e, Cat6, and Cat6a. Each of these cables are constructed of fundamentally similar twisted pairings of copper cables, and are each used with the same RJ-45 connection to plug into computers, routers, switches, or other network equipment. There are reasons for and against the use of all three, such as cost, ease of installation, and performance. Cat5 cabling is almost never used in new installations and is hardly even available for purchase anymore. It uses two of the four cable pairs to carry data and is only capable of speeds up to 100 Mbps at 100 meters. Cat5 cabling is outdated and has effectively been replaced by Cat5e. 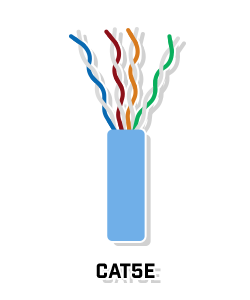 Cat5e, or Cat5 enhanced, is commonly found in networks and is the minimum cable type that should be used for any new network. Cat5e cable is capable of 1000 Mbps speeds at 100 meters of cable length, is constructed with tighter twisting rates of inside wires, and uses four pairs of copper wires to send data. Cat5e wires are also designed to reduce crosstalk, which is interference caused by electromagnetic signal emissions from adjacent wires. Cat5e cable is considerably cheaper than Cat6 or Cat6a cabling; and therefore, in situations where cost is a significant deciding factor, it is likely the better choice. Additionally, as it is more flexible than Cat6 cables, it is easier to install in tighter spaces, such as houses. Cat6 cable is a newer standard of cable and is constructed with more tightly wound cables than either Cat5 or Cat5e. Cat6 cables have a thicker sheathing and a nylon spline in the center of the copper cable pairs that, when combined with the higher cable twist rate, will reduce crosstalk from both inside and outside the cable, contributing to a Cat6 cable’s better performance. While the same as Cat5e at 100 meters, Cat6 cables are capable of much faster speeds (10 Gbps) at shorter cable lengths. It is common to see Cat5e cable used to reach computers and devices on the network, while Cat6 cables are used at the network’s backbone because of the distance limitations. With the potential for better speeds and less crosstalk, it is common to find new networks with all Cat6 cable. Cat6a, or augmented, cables are constructed with thicker, more twisted copper cable pairs and a thicker outer sheathe than Cat6 cables. Again, this helps to protect the cables from crosstalk, especially alien crosstalk, which is interference from separate cables. Unlike Cat6, Cat6a cables can carry the 10 Gbps data speeds across 100 meter distances. Compared to Cat5e and Cat6, the thicker Cat6a cables are both more expensive and harder to install when compared to Cat6 or Cat5e. Because of their improved shielding and thickness, Cat6a cables are better suited for industrial deployments than residential ones. 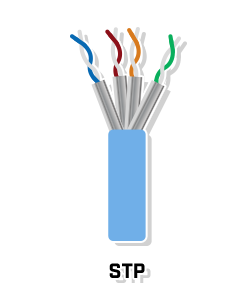 Another important consideration is that these cables can be constructed as shielded twisted pairs (STP) or unshielded twisted pairs (UTP). The shielded twisted pair cables have a layer of shielding around the individual copper wire pairs, separate from the outer sheathe of the cable. This additional shielding and the shielding built into the outer sheathe work together to further protect cables from interference and are best used in environments with motors, generators, or machinery that may cause interference. 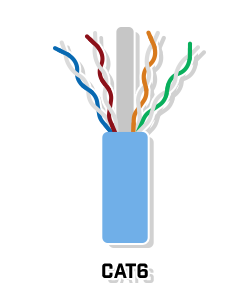 Cat7 cable is also available, but is not frequently used in typical network deployments. While these cables are capable of speeds as high as 100 Gbps at short distances and 10 Gbps at longer distances, they require a different connection type than the Cat5 or Cat6 cables. Cat7 cabling is constructed with both twisted pair shielding and a layer of shielding around the entire cable, which must be grounded. As a result, Cat7 cables are generally reserved for data centers or very large enterprise networks. Ultimately, the type of cabling you choose to use will likely come down to factors of cost, network speed demands, environment, and expected life of the cabling. Cat5e cables are the cheapest, and in many cases will get the job done. In situations or environments where they do not, Cat6 or Cat6a cables should be used instead, whether for better speed or better protection. Ultimately, for a network that will be around for a long time, Cat6a cable is the best choice as it can provide higher speeds at the full cable distances, helping to future-proof for when newer devices are installed.